T-Mobile has been working quickly to buildout its 600MHz spectrum that it picked up in the most recent spectrum auction. 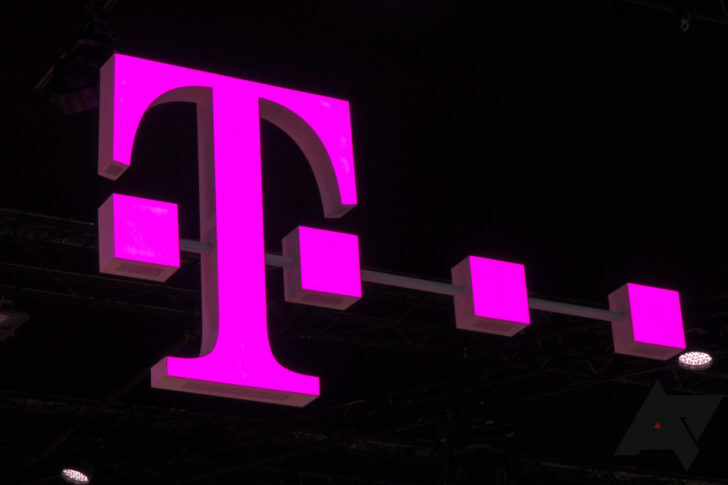 However, according to analysts at Oppenheimer, it appears that T-Mobile is spending more than initially thought, and thus estimates have been increased. Oppenheimer stated in a research report issues on Wednesday that they “spoke with TMUS (T-Mobile US) management, who appeared to be focusing on building out its 600MHz spectrum for increased coverage/capacity, the correct route in our opinion, but this will require more capex and we increase our estimates.” Oppenheimer increased its capex estimates by about $200 million for the current quarter, which brings the total to $1.55 billion. For 2018, T-Mobile executives expect to spend between $4.9 and $5.3 billion on its network. Rolling out spectrum is not cheap, especially when it comes to rolling it out nationwide, so it’s not surprising to see estimates increasing, as far as what T-Mobile is spending on its 600MHz spectrum here. But the bright side is that T-Mobile is doing it the right way. And that is building its 600MHz spectrum for increased coverage and capacity. Especially important in the age of 5G that will be a very important thing later this year and increasingly important in the coming years as well. T-Mobile spent nearly $8 billion on 600MHz spectrum during the incentive auction, essentially picking up 600MHz spectrum across the entire country. That is going to massively help its network and put it in a great place, with 5G on the horizon. For customers, this estimate increase by Oppenheimer isn’t really going to make much difference. But if you are an investor and own shares of T-Mobile, you’ll want to take this into consideration, as it is going to be shown on its upcoming quarterly report. Where the current quarter doesn’t end until June 30, it’s going to be some time before its earnings report is out – it should be around July 19. But it is actually a good thing that T-Mobile is spending more on its network, especially for customers. As that means the network is going to continue to be faster, even with more users being added. T-Mobile’s 600MHz-based 4G LTE service is now available in over 900 cities and towns spanning 32 states, the mobile service provider said Wednesday. The promise of the firm’s 600MHz holdings “exploding” in 2018 is hence still being fulfilled, with T-Mobile also vowing to bring the same service to Puerto Rico this fall. Last year’s hurricane tragedies in the U.S. territory have been seen by the company as an opportunity to completely rebuild its infrastructure and make it “better than new,” Chief Technology Officer Neville Ray said as part of a prepared statement. The network that’s now meant to go live in Puerto Rico later this year will consist of 5G-ready equipment, just like T-Mobile’s existing 600MHz setups in other parts of the United States. The carrier is presently offering six 600MHz-enabled Android smartphones. The Bellevue, Washington-based telecom giant’s aggressive infrastructural investments have even surprised some analysts, whereas its latest pledge to the disaster-struck territory is meant to go beyond relief efforts as the firm promised to “continue to invest in the island’s future.” The vast 600MHz holdings acquired by the company in April of 2017 are said to offer double the reach and four times better building penetration capabilities than mid-band LTE. 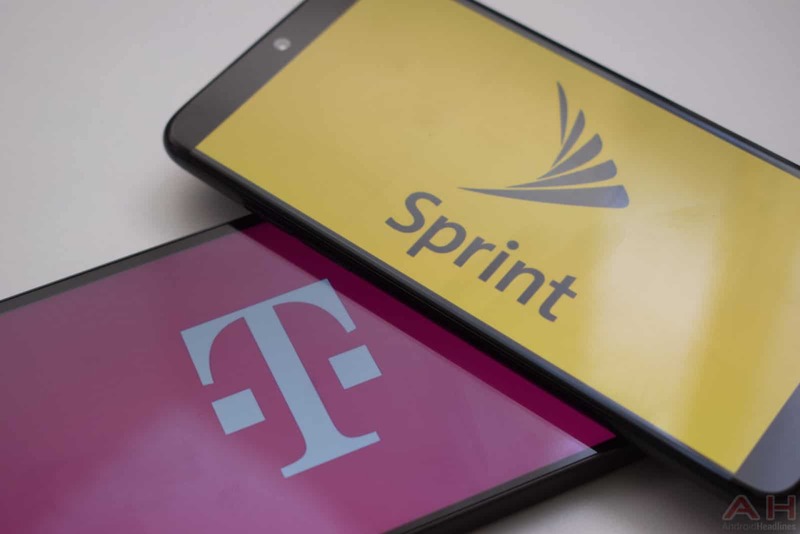 T-Mobile is also positioning the spectrum for its upcoming 5G buildouts, with its ultimate goal being to join its wireless portfolio with Sprint’s massive 2.5GHz holdings as part of their proposed merger valued at $26.5 billion. T-Mobile‘s chances of successfully combining with Sprint remain uncertain, with many analysts pointing to Washington’s handling of AT&T’s attempted Time Warner purchase as a sign that stateside regulators are no longer entirely open to big business mergers and not even vertical consolidations are now safe from scrutiny. The third- and fourth-largest wireless carrier in the country previously said they’re aiming to have their all-stock tie-up approved by the end of the first half of 2019. A U.S. Senate panel will be holding the first official hearing on the matter in three weeks. 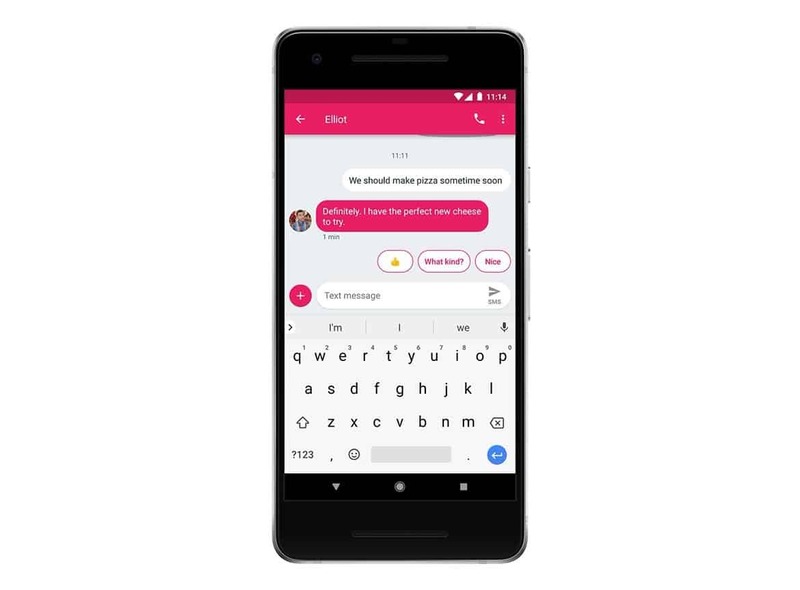 Following Google’s initial plan to roll out Smart Reply to Project Fi several months back, some T-Mobile users are now reporting that the feature is rolling out for Android Messages on the network. It’s worth bringing up that even if the feature is rolling out, that doesn’t mean it will hit every device on the network and isn’t necessarily confined to T-Mobile. For those who may not be aware, the Smart Reply feature in question is one that has been around for quite some time already in both Google Allo and Gmail. In the shortest possible terms, it is a machine learning-based tool that generates automatic replies based on the context of a received message and a user’s own preferred mannerisms. In general, it works fairly well and its inclusion in Android Messages means that users can spend less time typing when a short reply is all that’s needed. There are two devices running on T-Mobile’s network which repeatedly show up in at least one Reddit forum pertaining to the topic. That was created by a user posting under the handle “LinkofHyrule” and, more specifically, those include the Samsung Galaxy S9 and the OnePlus 6. Presumably, the Galaxy S9 Plus is a close enough match to its smaller sibling that the feature would be showing up there as well. Moreover, aside from its initial launch on Project Fi, there’s no reason to think that Google’s Smart Reply would be limited to those two handsets – let alone to a single carrier such as T-Mobile. So it’s entirely possible that the feature is undergoing testing and simply hasn’t been spotted elsewhere just yet. Bearing all of that in mind, if this is just a test rollout, users shouldn’t be too surprised if it doesn’t hit their own device for quite a while longer. Tests of new app features can take weeks or months to complete before a company is satisfied with the results and rolls them out more widely. In the meantime, Smart Reply will almost certainly arrive at some point over the course of the next year, as it has been spotted several times over the past several months. So users are just going to have to be patient. A little under one year ago, T-Mobile turned on the first site in the US to use its 600MHz frequency, a low-band chunk of spectrum that provides much more consistent coverage, especially indoors or in rural areas. Building out the new network on a nationwide scale isn’t a simple process, but the company just announced that it’s now up and running in 900 cities and towns across 32 states, a huge achievement in just 10 months. Of course, as with everything in life, there’s a catch. The 600MHz spectrum — which you’ll also hear referred to as Band 71 or Extended Range LTE — was until very recently used to broadcast analog TV into homes. T-Mobile is the first network in the world to use it for LTE, and as a result, the majority of phones don’t support it yet. That’s changing fast — recent flagship Android phones from Samsung and LG are compatible — but for anyone using an iPhone or an older Android device, all of T-Mobile’s efforts to roll out its 600MHz network mean nothing. To call it a “massive milestone” is really an understatement. Normally, rolling out new spectrum takes years. Verizon, for example, bought 700MHz spectrum from the FCC in a similar auction in 2008, and didn’t turn the network on until 2010. T-Mobile has a list of every town and city that currently has some B71 deployed; this map from Spectrum Gateway is a few months out of date, but is much easier to browse. T-Mobile owns 600MHz spectrum covering all of the United States, so everywhere should be covered eventually. However, some regions still have TV stations broadcasting on the 600MHz channels, and those stations have to be migrated before T-Mobile can activate its service. As for devices: right now, T-Mobile has six 600MHz-capable devices, including the LG V30, Samsung Galaxy S9, and Galaxy S9+. It says another dozen “across all price points” will launch this year. The big question, arguably, remains whether Apple will deign to launch a 600MHz-capable iPhone this year. 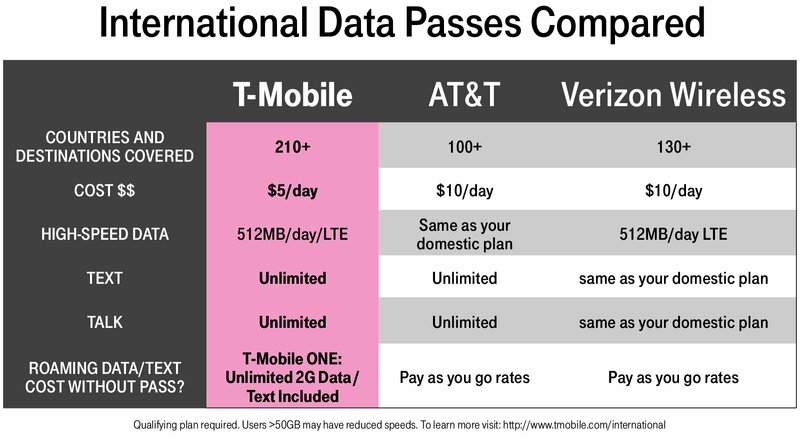 T-Mobile was the first US carrier to really push the idea of free international roaming. although the data speeds have always been terrible. Still, your T-Mobile phone works in other countries, which is more than you could say a few years ago. Now, Tmo has expanded free roaming to even more countries, and there's a cheaper option if you want LTE data while traveling the world. Before this announcement, T-Mobile offered free international roaming in 140 countries around the world. That means as much 2G data as you can use (not much) and free SMS. Calls are billed per minute but at lower rates in supported countries. Now, that same deal has been extended to a total of 210 countries. T-Mobile hasn't listed the new additions yet, but they'll be on the Simple Global site when the change goes into effect on July 22nd. T-Mobile's international data passes are getting a price drop as well. You can now pay just $5 per day for LTE service in supported countries. That comes with 512MB of LTE, after which you back down to 2G speeds. Day passes also include unlimited calls and SMS. You can purchase up to two day passes in a single 24 hour period if you need more data. The new data passes are available starting August 1st. T-Mobile has announced that it's partnered with Nokia to build its 5G mobile network. The carrier will pay Nokia $3.5 billion for "its complete end-to-end 5G technology, software and services portfolio." T-Mobile called the agreement a multiyear deal, but doesn't go into specifics, saying only that the two companies will work together "in the critical first years of the 5G cycle." Nokia will help bring 5G to T-Mobile's 28 GHz millimeter wave and its 600 MHz spectrum. In its announcement, T-Mobile talked up industry applications of 5G speed in areas like transportation, healthcare, and retail settings, as well as benefits for individual customers such as "on-demand virtual reality" experiences. The carrier announced in February that it plans to have 5G up and running in 30 cities by the end of the year, including New York and Los Angeles. It doesn't expect to have 5G-capable phones available until 2019, however. After releasing several more 600MHz LTE smartphones in recent weeks, T-Mobile today gave an update on its 600MHz LTE coverage. T-Mobile CTO Neville Ray has confirmed that T-Mo’s 600MHz LTE is now live in 992 markets across 33 states. You can see the full list of 600MHz LTE cities and towns right here. This number is up from the “more than 900 cities and towns” and 32 states that T-Mo said its 600MHZ LTE covered back in early June. When it comes to devices that can actually access that 600MHz LTE coverage, T-Mo currently offers 12 different models. This includes high-end phones like the LG G7 ThinQ, Samsung Galaxy S9, and Samsung Galaxy S9+ as well as more affordable devices like the Moto E5 Play, Moto E5 Plus, and Samsung Galaxy J3 Star. Leaks have hinted that T-Mo will have another 600MHz LTE phone, the LG Q7+, launching later this week. 600MHz LTE is a big deal because it can travel farther and is better at penetrating buildings that mid-band LTE. T-Mobile only sold a few 600MHz LTE phones at the start of 2018, so it’s good to see it aggressively expanding its 600MHz LTE lineup with a variety of devices across price points. This gives more customers the ability to access this 600MHz LTE coverage, whether they’re looking for a flagship smartphone or an affordable model. T-Mobile has been adding over a million customers each quarter for over five and a half years now, and the company’s subscribers have more than doubled since John Legere took over as CEO. The carrier has been doing all sorts of things to make it easier for the customer, and raising prices isn’t one of those things. It currently offers a single unlimited plan, which is called “T-Mobile ONE”. While there are a few variants to that plan, it is just a single plan, and that’s because T-Mobile wants to make it simple for its customers, and it has worked out well. 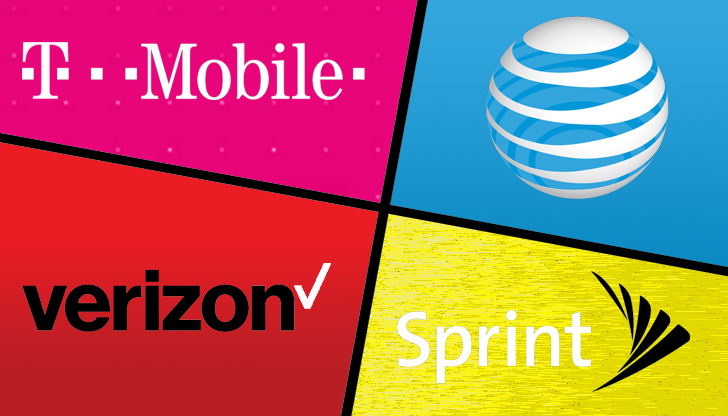 While its competitors – AT&T, Verizon and Sprint – all have more unlimited plans. While T-Mobile won’t be raising rates on its unlimited plan, the company’s COO, Mike Sievert did note that they will be aggressively promoting 600MHz-compatible smartphones. Which means they will likely be discounted rather heavily from time to time. This is so that they can get as many customers as possible onto its newer spectrum, which covers the majority of the US and will provide better in-building coverage. This is also a good thing for T-Mobile and its shareholders, as that is where the money is made these days – in selling actually products like smartphones and tablets. T-Mobile announced today that it’s launching a new mobile plan for people who only use their smartphones for the bare necessities. The plan is called T-Mobile Essentials, and it covers talk, text, and data for cheap — but there’s a catch. T-Mobile Essential, like its other plans, also costs more if you do not plan to opt into the family deal: the package starts at $60 for a single line, $30 for the second, and an extra $15 for every additional line added to the plan. Features offered with the T-Mobile One plan, including in-flight texting and unlimited music streaming, will not be available on T-Mobile Essentials. The new plan is $60/month for one line, $90 for two, and $15 per line for the next 3-6. Taxes are not included, and if you don't enable auto pay, you'll be charged an additional $5/month. It includes unlimited talk and text, unlimited 3G tethering, and 2G service in Canada and Mexico at no additional cost. Data is marketed as "unlimited," but T-Mobile says customers may experience slowdowns after using 50GB or when the network is congested. In other words, subscribers will be deprioritized just like MVNO customers. Video streaming is also capped at 480p, and a $25 SIM starter kit may be required. That's a lot of asterisks for a company calling itself the "un-carrier." In terms of pricing, T-Mobile Essentials closely competes with Sprint's 'Unlimited Basic' plan, which is also $60/month for one line. However, Sprint is even more strict with usage - music streaming is capped at 500Kbps, and games at 2Mbps. Verizon's cheapest comparable plan is 'Go Unlimited,' which is $75/month for one line. AT&T's 'Unlimited & More' plan is $70/month for one line, but includes TV streaming. T-Mobile Essentials will become available on August 10. More information is available on the carrier's site. T-Mobile wants to make it easy for non-customers to see what its network is all about. T-Mobile is offering a 30-day free trial that lets you try out its network for 30 days or 30GB, whichever comes first. If you sign up, T-Mo will send you a mobile hotspot with free 2-day shipping, and you just connect your current phone to the hotspot and give the T-Mobile network a spin. At this time, T-Mobile’s 30-day free trial is only available in three markets: Boston, MA; Austin, TX; and Atlanta, GA. The offer is only available to non-T-Mobile customers, meaning that it excludes T-Mobile for Business customers, MetroPCS subscribers, and customers of T-Mobile partners using the T-Mobile network. Anyone interested in taking advantage of T-Mobile’s 30-day free trial can visit T-Mo’s website and register. Once your eligibility is confirmed, T-Mobile will send the hotspot your way. There’s a limit of one free trial device per household, and once you participate, you’re not eligible for the trial for 6 months. When you’re done with your trial, your device becomes inactive and you can either return it to a T-Mobile store or give it to a friend who can then register with T-Mobile and get a SIM card to participate in the trial. T-Mobile has offered test drives of its network in the past, and this latest offer looks like a nice one for anyone that’s been thinking about making the switch. By using a hotspot to try out T-Mo’s network, you don’t have to worry about swapping a different SIM into your phone or anything like that. And by letting you pass your hotspot onto a friend when you’re done with the trial, T-Mobile is hoping that you might convince some of your friends or family to make the switch, too. The new perk, announced Wednesday at the company's latest "Uncarrier" event, will be available to subscribers August 28 through the wireless carrier's "T-Mobile Tuesday's" app. Pandora Plus, the middle tier of Pandora's music streaming options, offers unlimited skips, no ads and offline listening for $4.99 per month. The streaming service also has a Spotify-like $9.99 per month Premium option that lets users create custom playlists in addition to a free option that has a limited amount of skips and does not let you save music for offline listening. In addition to Pandora, T-Mobile has also teamed up with events company Live Nation to offer discounted tickets to upcoming concerts from artists including Charlie Puth, Counting Crows and Wiz Khalifa through its T-Mobile Tuesday's app. The company will also have a special "fast lane" for T-Mobile users when entering the venues and buying concessions. Sprint offers Tidal streaming with its Unlimited Plus plans while AT&T offers a choice of either Amazon Music or Pandora Premium as part of its Unlimited &More Premium offering. Verizon recently announced that it would be partnering with Apple Music to offer its unlimited users six months of Apple's streaming service. Spotify, which doesn't currently partner directly with a wireless carrier, recently teamed up with Samsung to better integrate its service into the South Korean giant's hardware. "This is just the first step in a larger strategic partnership between T-Mobile and Pandora," the executive said in a statement. "Expect to hear more." The OnePlus 6, like other OnePlus devices before it, is compatible with both T-Mobile and AT&T, but isn't sold in the stores of either. The 6T carried by T-Mobile will apparently be a separate model from the device's global release, tweaked and optimized to better run on T-Mobile's network. Thanks to its devices' high-end specs and design paired with aggressive pricing, OnePlus has already made impressive headway in the US market. A presence at retail locations could provide a significant boost to sales. In keeping with the price trajectory of previous OnePlus releases, the OnePlus 6T is planned to retail for $550, an increase of about $20 over the previous model. Pricing isn't finalized, however. The phone is to launch in October, but could be delayed if it doesn't get "technical approval" from T-Mobile. This is the red version of the OnePlus 6. You won't have to wait long for the successor OnePlus 6T. OnePlus' next flagship phone will get a feature that's new to the company: the backing of a major US carrier. T-Mobile will be the exclusive US carrier partner for the OnePlus 6T when it launches in October, according to several people familiar with the launch plans. That includes a specific version of the OnePlus 6T optimized for T-Mobile's network, the people said. The company, however, will still sell its standard global version that's unlocked and able to run on either AT&T or T-Mobile, as well as networks overseas. The price of the OnePlus 6T is tentatively set at $550, although that hasn't been finalized. For the phone-savvy, OnePlus represents an alternative to the $1,000 super premium smartphones offered by Samsung (Galaxy Note 9) and Apple (iPhone X). Its rise in popularity coincides with the decline of older stalwarts like HTC and LG. The partnership underscores the progress that OnePlus has made in the US. The Chinese phone maker isn't a household name, but has long attracted diehard Android fans for its mix of high-end specs and affordable prices. Having a place at T-Mobile stores means it'll attract more mainstream awareness through a physical presence in thousands of retail stores. "Getting carrier shelf space is a prerequisite to volume sales in the US," said Avi Greengart, an analyst at Global Data. While the typical route for a phone maker hoping to break into the US market is to work with a carrier -- typically on cheap phones first -- OnePlus took a different route and has steadily built its own cult following here by selling directly to customers online, often through "flash sales" where the product sells out quickly. Other companies have tried and failed to go directly after consumers. OnePlus's growing success here as a Chinese company contrasts with some of its peers, including Huawei and ZTE, which have seen their efforts hobbled by government pressure. ZTE is just now clawing back from its near death sentence after settling with the Commerce Department in a deal pushed by President Trump. This deal is a culmination of talks that began much earlier. The company's CEO, Pete Lau, said in an interview with CNET in January that he would begin talking with the US carrier this year. "If the right opportunity and right timing come along, we'll be very happy to experiment," Lau said through co-founder Carl Pei, who served as interpreter. The odds were always going to be high that OnePlus landed at T-Mobile or AT&T, since its global unlocked phones are compatible with the two carriers. Because of the need for different wireless standards or issues with network certification, OnePlus phones don't work on Verizon or Sprint. And while OnePlus is part of the same group that owns Chinese phone brands Oppo and Vivo, it lacks the resources to commit to building specific phones for different carriers. Verizon's notoriously high standards of testing already made a OnePlus phone on its network an unlikely reality. T-Mobile's version of the OnePlus 6T will be optimized for the carrier's network, including the new 600 megahertz band of spectrum being rolled out that promises better and faster coverage. T-Mobile Chief Technology Officer Neville Ray has often boasted about the improvement to the quality of the network thanks to the new swath of spectrum. The only hiccup with the US launch could come from the testing required by T-Mobile to get certification on the network. OnePlus is still in the process of getting what's known as "technical approval" at the carrier, according to one person. Failure to get the approval could cause a delay with the carrier launch. Also, presence in a US carrier store doesn't guarantee success, notes Lopez Research analyst Maribel Lopez. Just look at the Essential phone at Sprint. Sales rep often push the most popular phones for the quickest sales, which tend to be Apple and Samsung devices. But OnePlus' younger, more technically savvy crowd, however, lines up well with T-Mobile's core demographic. For OnePlus, getting a little of the Un-carrier mojo couldn't hurt. The story originally published on Aug. 17 at 5 a.m. PT. Update, 8:04 a.m. PT: To include additional background. Update, Aug. 18 at 4:07 a.m.: To include additional background. Update, Aug. 19 at 5:49 a.m.: To include additional background. Will T-Mobile's Big Bet on Customer Service Pay Off? T-Mobile is spending big on your own personal "team of experts." T-Mobile's (NASDAQ:TMUS) latest Un-carrier move isn't as splashy as some of its previous moves like offering unlimited data, taking out taxes and fees from customers' bills, or giving every customer free Netflix. The latest move is that it's improving customer service by offering a more personalized team of representatives to answer questions and help solve problems. Each region is assigned a "team of experts" that will be available around the clock for customer service calls. What's more, when T-Mobile customers contact customer service, they won't go through an automated service, they'll talk to a human being. All this extra manpower is going to cost a lot of money, but T-Mobile CEO John Legere thinks it will pay off in the long run. Considering the increasing saturation of the postpaid wireless market, record low customer switching, and how much customers value good customer service, it looks like Legere might be right. T-Mobile has done a great job of improving its subscriber loyalty. In fact, it was the only one of the four major carriers to improve its churn rate year over year last quarter. It set a new record for the company, 0.95%. Still, that number falls short of rivals AT&T (NYSE:T) and Verizon (NYSE:VZ), which are about 15 basis points better. Some 7.7% of wireless customers said a "priority customer care line with no wait times" would most influence their decision to stay with their current provider, according to a survey from Strategy Analytics. And 68% listed quality of customer service as an important factor when considering a wireless provider. Improved customer service could keep driving T-Mobile's churn levels lower. An 8% reduction in churn would get T-Mobile about halfway toward levels similar to AT&T and Verizon. That would equal about 400,000 fewer subscriber losses over the course of a year, resulting in $80 million in additional EBITDA, according to Strategy Analytics. That's a pretty good return for T-Mobile. For reference, Verizon has added just 880,000 net new postpaid phone customers over the past year, and AT&T added just 256,000. That's despite their extremely low churn rates. If T-Mobile can keep 400,000 customers per year from switching, that decreases the available pool of net additions for its competition while increasing its own net additions. What if everyone else follows suit? In Legere's presentation introducing the new "team of experts" strategy, he noted a lot of Un-carrier moves are designed to push the competition into action. We saw that happen when T-Mobile separated device billing from service billing and when it reintroduced unlimited data plans. It's unknown how the competition will respond to improving customer service. If the past is any indication, however, if the competition does jump on board, it could seriously mute the positive impact of the improved customer care strategy. When T-Mobile tried to increase customer switching by giving away new iPhones a couple years ago, all the competition followed suit. The net effect was that T-Mobile didn't attract any more customers than it would have otherwise; the ploy simply ate into its margins. The same could happen if AT&T and Verizon beef up their customer service teams. While T-Mobile might keep more of its own subscribers, AT&T and Verizon are just as likely to keep more of their subscribers as well, leaving fewer customers switching to T-Mobile. T-Mobile knows that's a distinct possibility, but it's willing to push the industry forward, and it's built a strong brand around that message. That's certainly valuable unto itself. And it's hard to argue with the results of the strategy. T-Mobile is adding a million new postpaid subscribers every quarter while the rest of the competition is fighting for scraps. That kind of growth makes it possible to take risks like spending more on customer service, especially when it could result in an additional $80 million hitting the bottom line every year. They just shared what they think are the ten best stocks for investors to buy right now to members inside their service Motley Fool Stock Advisor… and T-Mobile US wasn't one of them! That's right -- they think these 10 stocks are even better buys. Lots of people will be traveling this Labor Day weekend, and so T-Mobile is hoping to make that travel smoother with free Wi-Fi. On Monday, September 3rd, T-Mobile is giving everyone 30 minutes of free Gogo in-flight Wi-Fi. This offer will be available for smartphones on all Gogo-equipped domestic flights, and everyone can get it, even those people not on T-Mobile. With this offer, T-Mobile is hoping to give non-T-Mo customers a taste of what it has to offer. The T-Mobile One plan comes with free in-flight messaging and one hour of free smartphone Wi-Fi, and subscribers who get the T-Mobile One Plus add-on get unlimited in-flight Wi-Fi on Gogo-enabled flights to, from, and within the U.S. Existing T-Mobile customers are used to having free in-flight Wi-Fi, but this is a nice gift for those non-T-Mo folk that should make their Labor Day plane ride a bit better. If you’re on a T-Mobile One plan, do you use the free in-flight Wi-Fi perk? T-Mobile today provided another update on its 600MHz LTE rollout. T-Mo says that its 600MHz (Band 71) LTE coverage is now live in 1,254 cities and towns across 36 states, including Puerto Rico. This is up from the 992 markets across 33 states that T-Mobile’s 600MHz LTE was available in back at the start of August 2018. You can find the full list of 600MHz cities and towns right here. T-Mo also notes that is has enabled carrier aggregation for its 600MHz LTE and mid-band LTE, enabling customers with devices that support these features to access the capacity of both at the same time and get an increase in download speeds. T-Mobile’s 600MHz LTE coverage reaches farther and is better at penetrating buildings that mid-band LTE. It’s an important aspect of T-Mo’s network as it continues to expand and improve its 4G LTE coverage, and it’s good that we continue to see more 600MHz LTE coverage rolling out while additional 600MHz-capable phones are added to T-Mobile’s roster. T-Mobile’s 600MHz spectrum is a thing that T-Mobile customers should care deeply about. This is the band 71 LTE that will expand T-Mobile’s network into rural areas and buildings before it becomes 5G. It’s the band you should be making sure your next smartphone supports, like the Pixel 3. And today, that’s even more important, as T-Mobile announced that they’ve expanded 600MHz into 1,200+ cities and towns. In other words, you probably live in an area that can access this low-band, better-range signal, assuming your phone supports it. T-Mobile calls this a part of its “Extended Range LTE,” which is a decent descriptor and also includes their 700MHz spectrum (band 12). Their 700MHz spectrum already covers 80% of the US and this 600MHz fill continues to strengthen that rollout. This is the network advancement that will help put T-Mobile on-par with Verizon in terms of quality and reliability. As of today, T-Mobile’s list of Extended Range LTE phones includes Galaxy S9, S9+, Note 9, S8 Active, LG G7, V30, and Moto E5. That list should continue to grow rapidly, and as I just mentioned, will include the Pixel 3 and Pixel 3 XL. If you keep worrying about T-Mobile’s network based on its past reputation, these are the types of announcements that should make you feel much better about making the switch. In fact, you should jump in the comments right now if you are still worried about T-Mobile’s network and ask around. DL readers migrated over to T-Mo years ago and sure seem to be happy with the switch. Ericsson is going to be providing T-Mobile with its latest 5G new radio hardwareand 3GPP for a cool $3.5 billion. In case you hadn’t heard, Apple announced three new iPhones today. The iPhone Xs, iPhone Xs Max, and iPhone Xr are undoubtedly “the most incredible smartphones ever created,” as Tim Cook and his band of merry execs spent nearly two hours explaining to us today. But for one US carrier, the 2018 crop of iPhones is particularly significant. They’re the first that support LTE band 71, the 600MHz frequency that T-Mobile is using to build out its network. With most Android flagships from the last year already supporting band 71, Apple joining the party was the final piece that T-Mobile needed to start moving towards widespread compatibility with its new network. Why does any of this matter? Well, because 600MHz is going to be the backbone of T-Mobile’s network going forward. It’s the lowest cellular frequency in use, and lower-frequency signals travel further and penetrate buildings better than higher-frequency signals. They do so at the cost of some capacity, but for rural users who would give anything for a 10Mbps LTE signal, and don’t really care if it’s 50Mbps, 600MHz is going to be key. More importantly, T-Mobile has already spent a huge amount of money acquiring and building out its 600MHz spectrum, and all of that will be wasted if the most popular smartphones don’t support it. Apple snubbed T-Mobile and band 71 with last year’s iPhones, and there was some concern that the same thing would happen next year. There’s other good news for wireless on the new iPhones apart from compatibility with 600MHz. The new iPhones also support LTE-Advanced technology, including 4×4 MIMO and LAA. We’ve explained in the past how those technologies work, but the upshot for consumers should be less congestion and faster overall speeds. The improvement could be so significant that some network testing companies are suggesting that the new iPhones will raise the average mobile download speed nationwide. The last several months have been busy for T-Mobile. There are the ongoing merger machinations with Sprint, a new customer support model, and some 5G announcements thrown in for good measure, too. 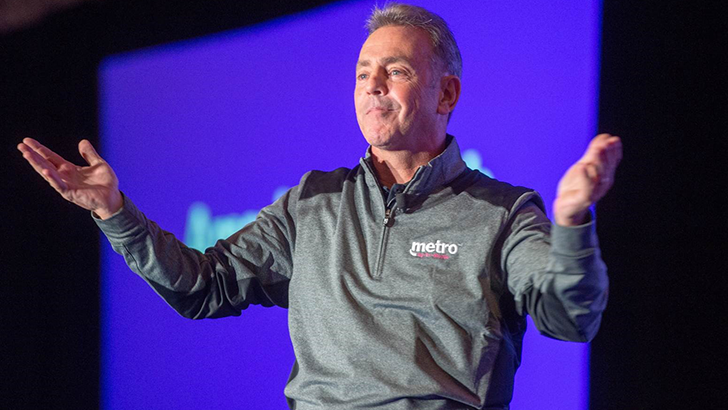 But the carrier has more up its magenta sleeves: it announced today that sub-brand MetroPCS is becoming Metro by T-Mobile, and gaining some new plans. The refreshed plan offerings include unlimited data and, at the $60 tier, Google One and Amazon Prime. For one line at $60 per month, customers get unlimited LTE data (reduced after 35GB, 480p streaming only), a 15GB LTE mobile hotspot, Google One's 100GB tier of cloud storage, and Amazon Prime, which unlocks free express shipping options, Prime Video, Prime Music, unlimited Amazon Photos storage, and discounts at Whole Foods. T-Mobile's own plans don't feature Amazon Prime or Google One, though there are other benefits. T-Mobile ONE customers, for instance, get Netflix and some Gogo in-flight Wi-Fi perks. At $50, Metro by T-Mobile customers get unlimited data and Google One, but no Amazon Prime and a 5GB LTE mobile hotspot. $40 provides 10GB monthly, while $30 gets customers 2GB — neither non-unlimited plan has additional hotspot data. Verizon offers unlimited data starting at $75 per line. Bonuses include unlimited talk to Mexico and Canada, as well as carryover data. AT&T has unlimited data starting at $55 per month for prepaid plans, and lets customers not only call to Mexico and Canada, but also use their services in those countries (though data speeds may be reduced to 2G). Cricket, owned by AT&T, offers unlimited 3Mbps-capped data for $55, or unlimited high-speed data for $60. H2O Wireless offers 8GB of LTE data with unlimited 2G data thereafter for $40. Consumer Cellular's largest plan is $40 for 10GB. While the new bonuses for Metro are certainly enticing, it is important to remember that T-Mobile customers will always be prioritized over Metro customers, especially at times of high network congestion. In short: T-Mobile executives have now claimed that the company’s ability to provide 5G fixed wireless access (FWA) is going to be almost completely dependant on whether or not its proposed merger with Sprint goes forward. That’s based on a 341-page redacted document currently housed by the FCC and authored by key executives in response to questions from the commission about the merger’s benefits. Specifically, the agency wanted to know exactly how ‘New T-Mobile’s’ fixed wireless plans would be changed by the merger. According to President and COO G. Michael Sievert, the merger will allow the company to build an in-home 5G solution that is competitive in terms of cost. Moreover, Sievert says that it will give home users who don’t currently have more than one option or who have no options for broadband more choice. While not possible as separate companies, the executive says that New T-Mobile could service as many as 52-percent of zip codes in the US. Background: The apparent deviance from earlier T-Mobile statements disparaging fixed 5Ginstallations as something other than “real” 5G and an apparent decision to ignore that segment of the market isn’t necessarily surprising. Fixed access points are expected to play a key role in expanding the availability of high-speed internet and more choice to customers across the country. Since that’s currently touted as a priority goal for the FCC, T-Mobile has apparently abandoned its previous position on 5G FWA to curry favor from the commission. The merger has faced stiff opposition due to concerns about whether or not reducing the number of major US carriers to just three companies would stifle competitiveness of the market. However, T-Mobile appears committed to remaining competitive and even increasing competition contingent on the merger going through. If it can successfully complete its goal, the company’s representatives now claim it will add as many as 1.9 million FWA subscriptions by 2021 and up to 9.5 million in the following three years. In addition to adding choice, T-Mobile claims jobs will be bolstered by increasing demand and New T-Mobile’s focus on customer care. That would include as many as 1,100 jobs in the enterprise sector of its business and 117,500 ‘job-years’ from 2021 to 2023 from the merger itself. The exact number of job adds expected, cost savings, and similar details, meanwhile, are all redacted in the documents in question. Impact: Although the exact figures with regard to savings and job creation are redacted, it may be safe to say that a successful merger could help continue spurring the current ongoing competition between the US’s primary providers. That could help sway an otherwise wary FCC to approve of the merger itself but the likeliness of that occurring could also be entirely dependant on exactly what those figures are. If the change in overall competition would only be slight, the FCC wouldn’t necessarily have a good reason to approve the merger on those grounds. In short: Mere minutes after Verizon announced the launch of the world’s first commercial 5G service, T-Mobile Chief Executive Officer John Legere took to Twitter to continue his years-long tradition of mocking the wireless carrier’s largest rival by subscribers. The industry veteran expressed befuddlement with the fact that Verizon’s 5G service is only available in “tiny pockets” of neighborhoods across four U.S. cities and can be crippled by certain appliances, foliage, and a number of other everyday items. He also argued the technology powering the solution isn’t scalable and is based on a proprietary standard, meaning its future development will likely be limited. “Do you have a better chance of getting Verizon’s 5G if you wrap your house in tinfoil,” the CEO asked while laughing at Verizon’s 5G Home FAQ page. Impact: Despite T-Mobile’s PR campaign and Verizon’s 5G Home launch, AT&T is still expected to deliver the first stateside 5G solution that’s both cellular and based on the 3GPP’s 5G New Radio standards. That network is said to be launching later this year but as first 5G-enabled smartphones won’t be released in the U.S. prior to early 2019, early adopters will have to rely on 5G “pucks,” or hotspots, to take advantage of the next-generation service. 5G itself is presently even being hyped upby the White House and is largely expected to be a massive force for a new economic boom that will allow for new technologies and create millions of jobs globally. I cannot begin to explain how important 5G is going to be for this country, so I have to say congrats to Verizon on delivering its 5G* Home Service today. It doesn’t use global industry standards or cover whole blocks and will never scale… but hey, it is first, right?! T-Mobile has come out on top of the major US carriers when it comes to having the fastest LTE data speeds for Q3. This makes it the Un-carrier’s 19th quarter in a row to hold the title. The data comes from real customers using Ookla’s speedtest app. Although the Q3 report isn’t showing up yet on Ookla’s website, it had over 2.8 million users providing data for its H1 2018 results. As you can see below, T-Mobile just edged out Verizon on both download and upload speeds with 31.7 Mbps and 11.5 Mbps, respectively. As is no surprise, AT&T followed in third place with Sprint coming in last. Notably, the top three all share relatively fast speeds. While fast LTE speeds are great, Verizon and AT&T tout greater coverage than T-Mobile. Although if the T-Mobile/Sprint merger goes through, maybe the new T-Mobile could end up with improved coverageand the fastest speeds.